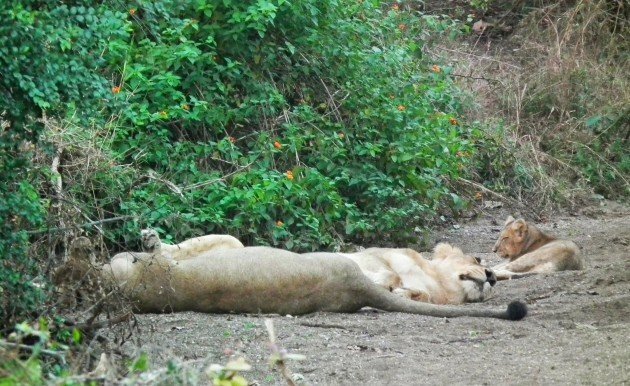 After several game drives, once again we are at the front gate of the Gir National Park in the state of Gujarat. This park protects the largest remaining tract of dry deciduous forest in the west of India, offering visitors 37 species of reptiles, 38 species of mammals and, not to be forgotten – almost 300 bird species. 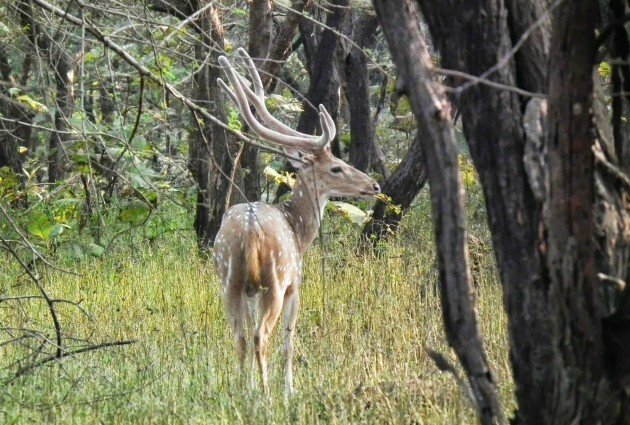 Lions aside, carnivores are represented by Leopard, Hyena, Jackal, etc., while herbivores are represented by Chital (above) and Sambar deer, Wild Boar, Nilgai antelope, etc. The largest reptile is the Indian Mugger Crocodile. A flock of Crested Treeswifts is circling above us. Judging by the map in the field guide, they are not supposed to be here at all. Yet, they have – wings! 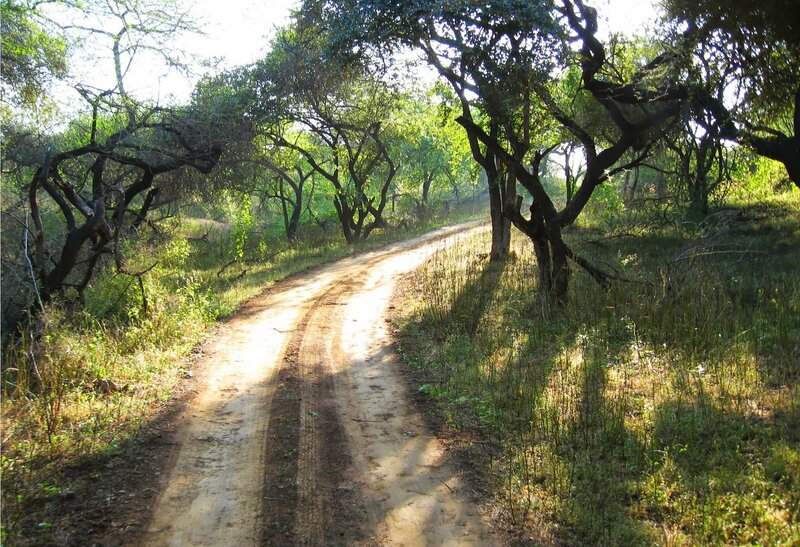 An open Gypsy follows dirt tracks through dry deciduous forest dominated with teak. Gir comprises diverse habitats, from open scrubland to both dry deciduous and tropical thorn forest and evergreen corridors along the rivers. Disinterested Gray Langurs await us in the next tree crown; one Black-rumped Flameback woodpecker is searching the branches, while one gorgeous Tickell’s Blue Flycatcher flies by. On the low acacia by the road, a Shikra keeps a watchful eye on us. 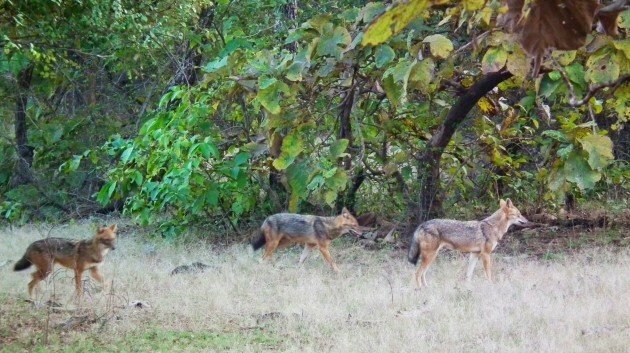 The commonest large mammals of the park are smallish, spotted forest deer – Chitals, and we often encounter small herds. Several Indian Peafowl are searching dry leaves by the roadside. Being used to peacocks as decorative garden birds, I find it hard to recognize them as authentic wild birds. We are crossing the ridge and entering the valley of one of the seven rivers of the park. In the dry season, surface water becomes hard to find and the park officials have created four larger dams, but also numerous small ones wherever the road crosses the river. At the bank of one such small dam, a Softshell Turtle basks in the afternoon sun, while one Oriental Magpie-Robin is searching the water edge. A low branch is decorated by a Green Bee-eater (above) and a tree top above it holds several Cattle Egrets. There is a Red-wattled Lapwing on a mud bar, while behind a dry bush… some bird is playing hide and seek with us… a lovely White-breasted Waterhen. After a positive ID, it flies to the protruded roots of a large tree, showing itself well in the soft sunlight. A little bit further, while watching a large Sambar wallowing in the mudbath, Manoj points our attention to a Crested Honey Buzzard on one and a Changeable Hawk-Eagle on another tree. Maybe his reputation is not without a foundation? 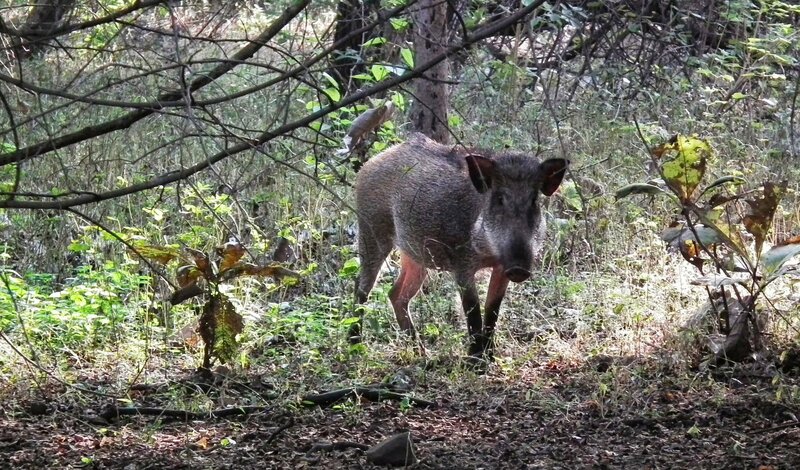 Wild Boar stands next to the road, watching us without nervousness or fear. It belongs to the same species as those in Europe, but a smaller subspecies (Sus scrofa davidi). Underneath an arched branch, one familiar bird, a Common Blackbird female… but after a recent split in 2005 by Rasmussen and Anderton, it was elevated to a full species – Indian Blackbird (Turdus simillimus). …and then, for no obvious reason, we suddenly stop! We have almost forgotten that Manoj has promised us some creatures of the night, when he raised his hand to point at three Mottled Wood Owls right above us, beautiful large Strix owls slightly amused by us. There is barely enough light for a photo. And when our driver continues, we have a new respect for our guide and feel sorry that we had no chance to book his services for earlier drives. The only true bird guide among the numerous park guides, he was busy showing – mammals to the tourists (we are certainly not tourists – we are birders!). After a short drive, we stop again and Manoj leads our eyes up a tree trunk, than a side branch and… to the Indian Nightjar lying low along the branch and melting into it with its camouflage plumage. A longish drive – long enough to forget that he has actually promised us two owls. Yet, we stop again and Manoj points our attention to a hole half-way up a tree trunk: there is an Indian Scops Owl in it. Manoj really knows his owls. There is no more reason to stop, se we go all the way, roller-coaster style, real danger for naive deer that prove wise enough to avoid us. 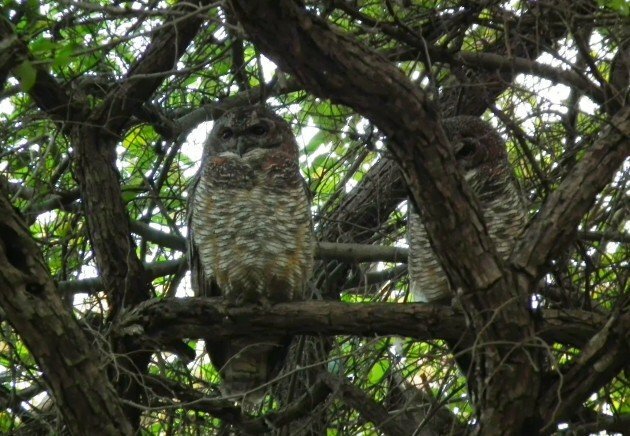 Two owls and a nightjar! Gir is a fantastic birding area! 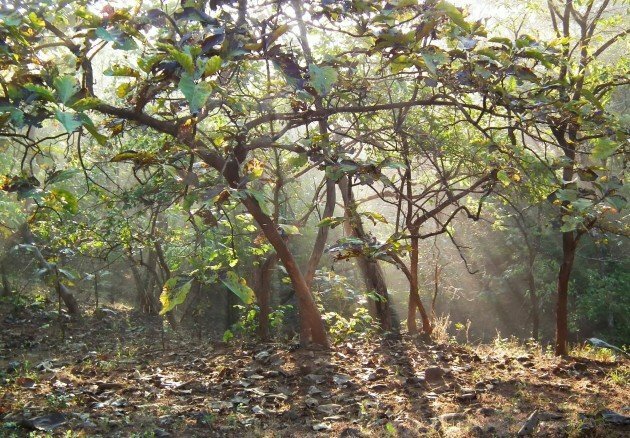 In the words of Indian ornithologist Salim Ali, had Gir not been the Lion sanctuary, it would have been termed one of the finest bird sanctuaries in Gujarat. We gave Manoj twice the usual and well-earned tip, promising to recommend him to other birders. Promise fulfilled. What a journey! Thanks for this terrific report of yet another place I can’t wait to visit. 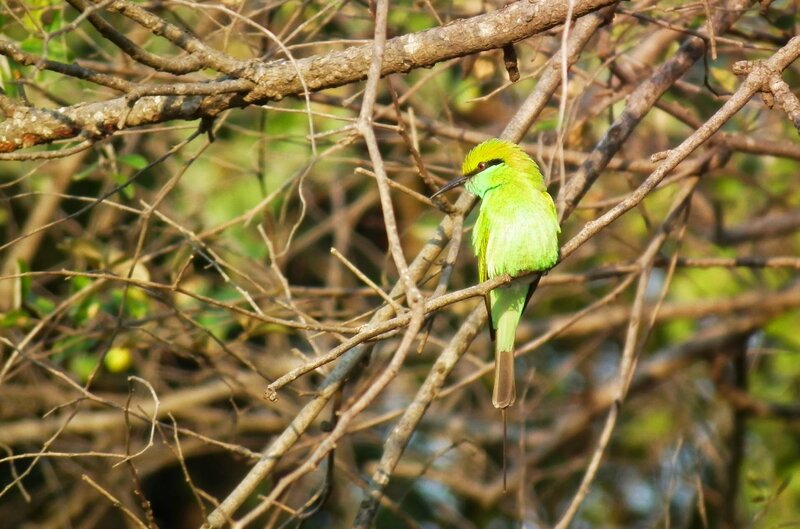 I did some great birding in India, Sariska specifically. Lost all my books form that trip, so Ihave to rely in my memories of Indian Eagle Owls and Sarus Cranes. Great write-up, Dragan! The American environmental author David Quammen wrote about Gir in his book Monster of God. You’re right: he wrote about the lions and not the birds. Each one of your posts bumps India further up on my desired locations list. 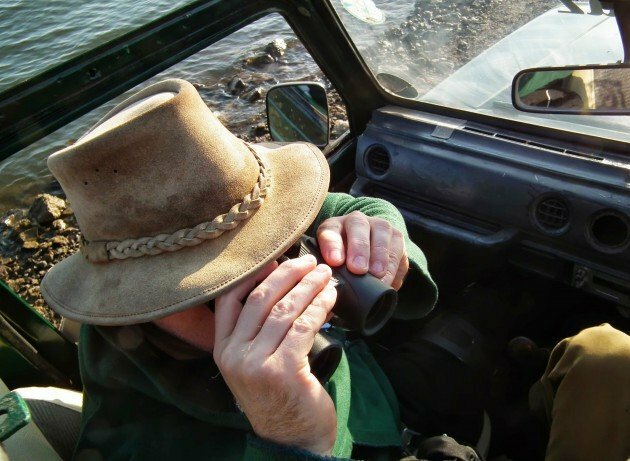 Dear Frank, I have birded India three times and while I have upgraded from the first to the second edition of the Inskipp’s bird guide, it is only now that I have bought my first ever travel guide to India – I didn’t wanted already made prefabricated opinions. I wanted to travel as tabula rasa and get my own impressions and opinions. It turned out to be hard to get an opinion – one either loves India or not, it not an opinion. And I have fallen in love.